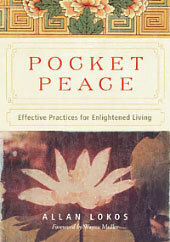 Pocket Peace is a collection of more than 50 concise spiritual practices, distilled from a Buddhist teaching, that can help one think, speak, and act wisely in life’s most challenging situations. These practices, small enough to fit in a pocket yet powerful enough to change a life, can uplift the spirit, help one deal with disappointment and anger, and bring inner peace and greater happiness. 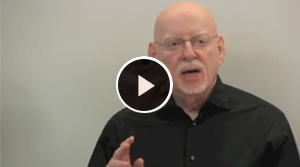 To learn more about Pocket Peace, read the transcript of a Voice of America interview with Allan. Read Allan’s article in Beliefnet. Wisdom enables us to see beyond ego and to gain clarity where there might otherwise be confusion. Wisdom is free from greed, hatred, and delusion. Wisdom sees that taking the same action over and over again and expecting the results to be different is a form of insanity. Through the eyes of wisdom we look at history and see that if war was the way to peace, we would have had a world at peace a very long time ago. We have tried war time and again through the millennia, and we still do not live in a world at peace. We can look at our personal history the same way. When we have been in conflict with others, has it brought inner peace? Wisdom invites us to explore other ways when our current approach is not working. Wisdom asks us to consider what the Buddha referred to as The Eternal Law: “Hatred does not cease by hatred, by love alone does hatred cease.” (Dhammapada 5) Most of us tend to look at the people and conditions outside ourselves to provide our happiness. Yet the reality is that if we cannot find happiness within ourselves, we cannot find happiness anywhere. Our quality of life is determined not by the people and events in our lives but by how we experience those people and events. All that we are is the result of our thoughts-with our thoughts, we make our world. The Buddha taught that all phenomena arise due to the causes and conditions that precede and accompany them. In other words, all events, all feelings, all situations are born, and likewise pass away, due to the concurrence of accompanying factors. Nothing exists by itself; everything exists in relation to everything else. Understanding and accepting the interdependent nature of all things lays the groundwork for the arising of wisdom. It is a vital element in seeing things as they really are. It is also wise to remember that it is the nature of a rosebush to produce roses. If we want lilies to appear, we will be disappointed. How often are we hurt when a friend or relative reacts in the same way he always has and not in the way we would want? Holding on to negative feelings hardens the heart and closes us off from the happiness that can be ours, even during difficult times. When we hold on to anger because of what we feel another person has done, we are not being wise. When we allow ourselves to become bitter because we are in a difficult situation that we feel can never change, we are again not being wise. However, when we see that any situation can, and will, change, we are seeing things as they really are, and that is the ground of wisdom. It is also wise to do what we can to encourage the change within ourselves that will free us from anger, resentment, and bitterness. As mentioned previously, it is not situations and conditions that cause our happiness and unhappiness but how we experience those situations. When we see this clearly we can think, speak, and act in ways that relieve sorrow and misery and lead to greater happiness for ourselves and those around us. Near the end of the Buddha’s life, his attendant Ananda asked who would be their teacher when the Buddha passed away. The Buddha replied that each person must be a lamp unto themselves, meaning that each of us must learn to see the true nature of things. That is the essence of wisdom-to see and understand for ourselves how things really are. The development of wisdom requires an open mind and the ability to listen to views that are different from our own, to be objective rather than knowing, and to be open to changing our views when truth contradicts them. The evening of December 24, there was a big party at our hotel in Mandalay, with lots of people, food, music, and gaiety. Then, the morning of December 25, Christmas Day, we, along with some sixty-nine others, boarded Air Bagan flight number W9-011 for Heho Airport near Inle Lake, an area popular with tourists for its floating markets and unique method of fishing. There were some patchy low clouds outside as Susanna and I took seats a little more than halfway back on the left side of the plane. The twenty-five minute flight left at 8:30 A.M. but never arrived at its destination. About a mile before the airport, we crashed. The plane went dark right away as we skidded, swirled, and bounced on the ground for five hundred or so feet. The cabin immediately began to fill with a dense, noxious, black smoke and the smell of jet fuel. We had torn through electrical wires as we came down and we could see outside our window that the plane was already ferociously on fire. We were in real and imminent danger. The passengers started pushing toward the front of the plane. I held up my hands trying to calm them: “Easy everyone, don’t push, we’ll all get out!” No one paid attention to me and I realized that they did not care what I was saying. I pulled Susanna in front of me intending that we also exit through the front of the plane. There was tremendous chaos and we were making no progress moving forward. Susanna turned back to me and said she did not think we could make it to the front exit, as she already could not breathe. We were near the emergency exit and although it was engulfed in roaring fire, we would have to jump out through the flames. With a nod of consent from Susanna, I gave her a push and out she plunged through the flaming doorway to the ground below. In retrospect I now realize that I had no idea what I was pushing her into or how far she would be jumping. There was no choice. It was all instinct. Jump or be scorched. The open emergency door revealed that the plane was now seriously in flames with the fire’s searing arms blazing in every direction. As I made my move to follow Susanna, there was what proved to be a disastrous moment. My foot caught on something and I was stuck. I was not just surrounded by fire, I was now in it, and I could not move. I called out for help but no one responded. I was frightened. Perhaps more accurately, I was terrified. I could feel my heart pumping in my throat yet, at the same time I was fully present to the situation and quite calm. I worked quickly to release my leg and after a ferocious battle (which later Susanna told me took close to a minute), I freed myself. I also learned later that such was my effort to survive, that I tore through the leather of my left shoe trying to free my leg. I jumped through the flames to the ground, but I was already severely injured. On the ground Susanna immediately grasped my arm and began to drag me away from the plane. I could not move my legs but we gave it all we had until we could no longer move. She also did not know that she had suffered four broken vertebrae in the crash (not that anything would have stopped her from trying to carry me). A crowd was gathering and two teenage boys ran down and tried to help drag us up the slope where the plane had crashed. If I looked straight ahead, I saw the faces of the gathering spectators, who, as they stared at me, looked truly horrified. If I looked down, I saw large sheets of skin hanging from my hands and legs. That skin and those faces should have scared me, but I think I was simply too numb, too dazed, or too deeply in shock to realize the seriousness of my condition. As Susanna and my new friends dragged me up the hill through the throng of stunned spectators, a middle-aged woman with a serene face and an equanimous demeanor leaned out of the crowd and looked directly at me. When we were about an arm’s length from each other, she quietly said to me, “You will be all right, sir.” I never saw her before and I have never seen her since, but I cannot imagine that I will ever forget her. Surely there is no such thing as a stranger in this world. How many times in my moments of deepest despair have her words come back to me? “You will be all right, sir.” Yes, my sweet nameless friend, I will. I will be all right. A moment of kindness, a compassionate smile, can not only uplift another being, it can save a life. 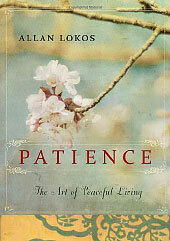 Patience: The Art of Peaceful Living is a comprehensive exploration of one of life’s most essential, yet elusive virtues. The author explores the nature of anger and impatience and offers in-depth practices for developing true patience to the point where it becomes part of who we are. “I have just finished reading Patience: The Art of Peaceful Living, by Allan Lokos, the founder and guiding teacher of the Community Meditation Center in New York City. It’s a timely read for a season in which the stresses seem to multiply in direct proportion to the peace and joy we’re supposed to be feeling—and too often, don’t! In many ways, the book is a very readable course in Buddhism 101, a primer in Buddhist thought and practice for those who will value the introduction; it is also an important refresher course for those of us who have been practicing for a while—and who recognize that it’s still, and always, about “beginner’s mind.” Patience is at the very heart of Buddhist practice: without it the noble Eightfold Path would be impracticable for even the most ardent of its followers. A wise and, yes, patient guide, Lokos leads his readers through the benefits of patience with, first, ourselves and then with others in our personal and professional relationships. He offers the inspiration of notable exemplars, and includes not only the words of wisdom of great teachers in the Buddhist tradition, but also simple, do-able exercises and practices to help us along the way. The Atlanta Journal Constitution chose Patience as one of six books recommended for 2012. What is there about the quality of patience that causes so many of us to respond to the very word with a sense of deficiency? “I don’t have enough, I need more,” we say, putting it in the rarefied domain occupied by such phenomena as time and money. No matter how much money people have, they seem to feel they need more and, indeed, in difficult economic times, many truly do need more. As to time, in any given day we all get exactly the same amount. There’s not much point in pleading for more because in each hour the clock offers only the allotted number of minutes and seconds agreed upon by our ancient ancestors. Grudgingly, it ticks with a relentless, unyielding persistence that alters not for even the most saintly or Buddha-like among us. The accepted measurement of time allocates twenty-four hours for each day, and for now and the foreseeable future, that is it. So we alter our approach and try to squeeze just one more project into the day’s already bloated schedule. The wonderful thing about patience, unlike time, is the more we use it, the more we have. Also, by its nature, patience creates a spaciousness that lets us feel as if we have more time than we have ever had. Thus, patience can alter our everyday experience from one of anxiety and deficiency to one of peace and plentitude. One of the major issues so many of us deal with is impatience—with ourselves, with others, and with an enormous range of situations. Anger and annoyance arise and we can lose our patience in an instant. Some of us have experienced so much impatience that we just assume we “do not have a lot of patience.” (Why we refer to the virtuous quality of patience as if it were a commodity that can be measured quantitatively, I don’t know.) We seem to believe that an emotional state is something that is embedded in us and that we can’t free ourselves from it. The current vernacular suggests that we are “hardwired” a certain way and we cannot change. In truth, what happens is, we experience an emotion and then too often attach to it as if it were an innate aspect of our very being. Some of us label ourselves “an angry person,” ignoring that the basic nature of sentient beings is more likely compassionate and kind, not angry and unpleasant. We allow ourselves to believe that anger and impatience are a part of who we are rather than understanding that they are simply feelings that arise. Like anything else that arises, feelings pass away. They do not define character. Repeated outbursts of anger and frequent loss of patience most likely indicate fear and unhappiness. They are unpleasant to experience, but they are not fixed, permanent conditions. Again, it is important to remember that even if we frequently experience the arising of impatience or anger it does not define who we are. To begin an exploration of the practice of patience it is helpful to have a sense not only of what patience is, but also of what it is not. For example, when facing an intolerable situation such as two-year-old Jimmy’s latest inexhaustible tantrum in a crowded supermarket, gritting your teeth and slowly counting to ten is not true patience. Likewise, while waiting on an interminable line, say at the airport security gate (which you suspect is not all that secure), consciously breathing deeply (and perhaps loudly so that the person you believe to be causing the line’s comatose state can be made acutely aware of your annoyance) is also not true patience. These practices are more like techniques, skills used for getting through a challenging situation without completely “losing it.” They employ qualities such as forbearance, tolerance, and endurance, and even if they feel forced or contrived they can put a bit of space between your feelings and your actions. They are a starting place and can be invaluable, although they are not yet the skills that will bring insight and advance us on the path to greater wisdom and inner peace. They do not emerge naturally from a well-practiced and skillfully developed patience. That is because the development of genuine patience requires introspection over time so that we can come to know the root causes of our impatience. Patience is born when we create a pause between our experience of a feeling and our response to that feeling. Without a pause we are likely to find ourselves reacting in our conditioned manner. After all, that is what conditioning is. With a pause there is at least the possibility of a more positive response and certainly we are less likely to cause harm. Patience lives in the gap between our experience of an event and our response to that experience. If we spend time with our experience–the thoughts, feelings, and sensations that arise–we can gain insight. Wisdom arises as we see things with greater clarity. Forgiveness has space to develop; fires have a chance to cool. The title of this book, Through the Flames, is not metaphoric. In this remarkable account, Allan Lokos shares the story of his gradual recovery from a devastating plane crash in Burma - a recovery helped immeasurably, and even made possible, by the great qualities of his heart. This is a story of amazing fortitude, compassion and wisdom. Through the Flames is beautifully written, completely engaging, and very inspiring. Rather than being overwhelmed by his intensely painful and disabling burns, Allan Lokos offers us lessons of hope, compassion, and even joy - a phoenix rising from the ashes. Gripping, haunting, and helpful, this is a remarkable book from a remarkable man. Through the Flames illustrates how we can awaken our hearts through whatever events unfold through our lives. With deep wisdom, honesty and humanity, author and Buddhist teacher Allan Lokos shares the inside story of not just surviving a deadly plane crash, but being profoundly spiritually transformed through the harrowing aftermath. Whether your crash is a divorce, death of a dear one, loss of financial security or serious illness, this beautifully written story will guide you in finding the blessings of love, peace and freedom in the midst. There is a statue of Buddha from a thousand years ago that has no eyes and no hands, and yet the truth and love of the Universe seem to glow where it’s eyes and hands once were. It’s as if the statue had endured and weathered time solely to reveal that truth and love. Allan Lokos has suffered and been worn like this and truth and love glow from his person and his words. Through the Flames will make you feel what is tender, listen to what is lasting, and make you want to carry what matters through everything. This is a riveting tale that begins with the sort of unimaginable tragedy that lurks in our darkest nightmares. But instead of a journey of suffering and pain, Allan Lokos offers up a memoir of recovery that becomes a glorious display of fortitude, resilience and wisdom. Lokos was chosen, it seems, to personally answer the question wrestled with for centuries by everyone from Buddhist scholars to meditation neophytes: can the practice of mindfulness and meditation actually allow the human spirit to triumph over extreme and unimpeachable suffering? Yes, his story tells us. And it offers lessons in courage, humor, and compassion for the rest of us as well. I was transfixed and couldn’t put it down. It is stunning and inspiring. “Once burnt, twice shy,” the saying goes. And yet, Through the Flames proves that his heartrending fiery ordeal made Allan Lokos twice as courageous, twice as determined, patient and compassionate. His story – utterly fascinating and inspiring – makes us want to imitate his admirable way of coping. Indeed the author offers us solid practical advice how to go through the flames we ourselves must endure and come out more like the persons we deep down want to be. A treasure of wisdom and compassion awaits you between the covers of this book. 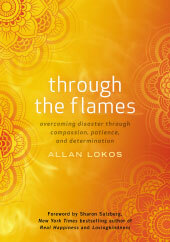 In Through the Flames Allan Lokos shares his personal suffering while healing from a traumatic injury. His story brings us all closer to the wisdom and the determination we all have within us to live life deeply. This book is on one hand a story of our common bond in suffering and the other a new and refreshing opportunity to learn from a master the practical ways meditation, patience, and self-compassion can help us live. In this heartfelt and unflinching memoir, Allan Lokos gives a lucid account of how Buddhist practice enabled him to come to terms with a life suddenly interrupted by a violent accident and its aftermath. Through the Flames is an inspiration. It is the story of the patience and the kindness we are all capable of, no matter who we are or what we go through. It is the story of the incredible resilience of the human spirit, and the fact that we can each learn how to access it and to trust it. Seeing someone, right in the midst of their vulnerability and distress, turn again and again to awareness, love and compassion is inspiring beyond words. After miraculously surviving a plane crash in Myanmar, Allan Lokos shares what his long and painful recovery process is teaching him about humanity’s ability to survive—and even thrive-in the face of suffering. In Through the Flames, Allan tells the terrifying story of being trapped in a plane when it crashed and exploded in flames. He was severely burned in the accident, and in the days and weeks following the crash the many doctors who examined Allan determined that he would not survive. In this inspiring account of his against-all-odds recovery, Allan uses his decades of experience cultivating compassion, mindfulness, and wisdom to examine the challenge of human suffering, and addresses the question of how we can thrive in the midst of pain and adversity. Concise insightful practices for enlightened living. An in-depth exploration of this essential quality. 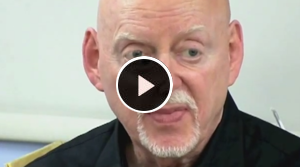 ALLAN LOKOS is the founder and guiding teacher of The Community Meditation Center in New York City. He is the author of Patience: The Art of Peaceful Living, Pocket Peace: Effective Practices for Enlightened Living, and Through the Flames: Overcoming Disaster Through Compassion, Patience, and Determination. His writing has appeared in The Huffington Post, Tricycle magazine, Beliefnet, and several anthologies. Among the places he has taught are Columbia University Teachers College, Albert Einstein College of Medicine, The Omega Institute, The Milken Institute, The Barre Center for Buddhist Studies, Marymount College, The Rubin Museum Brainwave Series, Buddhafest, The NY Open Center, Tibet House, NY Insight Meditation Center, and Insight Meditation Community of Washington. Allan has practiced meditation since the mid-nineties and studied with such renowned teachers as Sharon Salzberg, Thich Nhat Hanh, Joseph Goldstein, Robert Thurman, and Stephen Batchelor. Copyright 2014. Allan Lokos. All Rights Reserved.